Abstract - The Phase Detectors determines the relative phase difference between the two incoming signals and outputs a signal that is proportional to this phase difference. The phase detector also detects the frequency error; they are called Phase Frequency Detectors (PFD). It is very important block for the Clock and Data Recovery circuit. This project presents the different design schemes of the PFD and compares them with their output results. 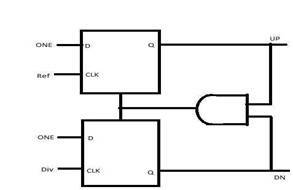 The circuits that have been considered are the PFD using NAND Gate, PFD using NOR Gate and PFD using AND Gate. The PFD is implemented with True Single Phase Clocked logic. The different PFD circuits are designed and simulated on NG Spice Tool using CMOS process technology with supply voltage 1 V.
The rapid growth in wireless applications in last decade has motivated to design fully integrated, low power, low cost and high performance transceivers. The Clock and Data Recovery circuit is most importance in wireless communication device which is useful to generate clock and recover the data. Clock and Data Recovery finds wide application in the area such as Serial data communication, Repeater, satellite communication, optical transceiver, chip to chip interconnects etc. The circuit consists of two resettable, edge triggered D flip flops with their D inputs tied to logic 1 and a NAND Gate in the reset path(fig.2). The explanation of the general operation of the PFD begins by describing the initial state of the device. First, the UP and DN signals are reset to low or zero and assume both the Ref frequency signal and the Div signal are high or one. Additionally, the Ref frequeny waveform is slightly leading the Div waveform, hence as falling edge occurs on the Ref input, the high or one on the D input is transmitted to the Q output or UP.Short time later, the Div waveform experience a falling edge and the Q output or DN of the other flip lop is set. Once both UP and DN are high or ONE, the NAND gate experiences a transition to force the Reset signal to zero. The flip flops are designed so that zeros on the Reset signal resets the Q outputs to zero. The PFD is implemented with True Single Phase Clocked logic. 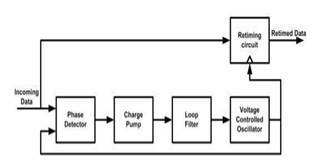 The design strategy is to minimize the number of transistors and the amount of power consumed. However, not all of the transistors can be implemented with minimum width such as those involved in the reset operation. The schematic of PFD using NAND Gate is shown in Fig.3. Div, then UPb goes to logic low i.e. UP keeps high until the rising edge of Div makes DNb on low level. Because UPb and DNb are NORed, so Reset goes to logic high and resets the PFD into the initial state. The schematic of NOR Gate based PFD shown in Fig.5 which consisting of only 20 transistors. D flip flops with their D inputs tied to logic 1 and a NOR Gate in the reset path. The Ref and Div serve as clocks of the flip flops. Fig.6 shows the PFD using AND gate. The circuit consists of two edge triggered D flip flops DFF which is resettable, with their D inputs tied to logic 1 and a AND Gate in the reset path. The Ref and Div serve as clocks of the flip flops. Suppose the rising edge of Ref leads that of Div, then UP goes to logic high. UP keeps high until a low to high transition occurs on Div. Because UP and DN, are AND, so Reset goes to logic high and resets the PFD into the initial state. The PFD is a state machine with three states. 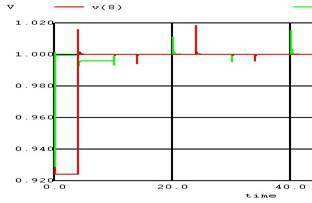 When Ref leads Div, the UP output is asserted on the rising edge of Ref. The UP signal remains in this state until a low to high transition occurs on Div. 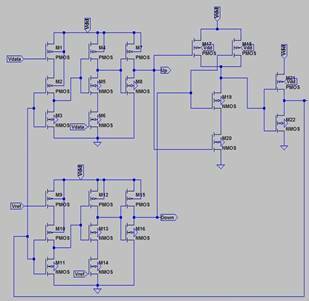 At that time, the DN output is asserted causing both the flip flops to reset through the asynchronous reset signal. 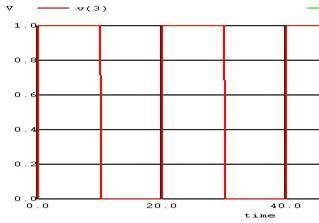 There is a small pulse on the DN output, whose duration is equal to the delay through the logic gates and the reset delay. 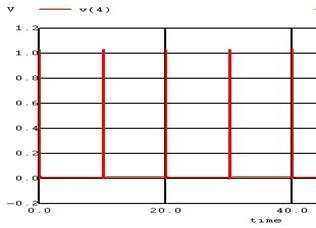 The pulse width of the up pulse is equal to the phase error between the two signals.Here, Ref signal is equal to the Data Signal and Div signal is equal to the Clock signal. Table I represents various parameters for the different PFDs when they are designed on NG Spice. It is seen that NAND based PFD has the minimum power consumption and occupy less area compared to the other two. They all have the same range of operating frequency. Dead Zone problem is also negligible for the NAND Based PFD. 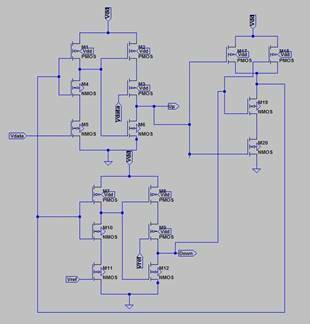 Minimization of power consumption is essential for high performance VLSI systems. 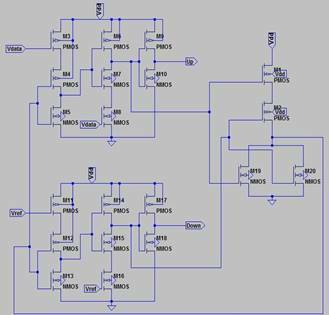 This project compares the performance of Phase Frequency Detectors by different Logic Gates .As can be seen from the simulation results AND based PFD consumes maximum amount of power among all the PFDs and has highest delay. NOR based PFD consumes more area and power compared to the NAND based PFD.Therefore, in order to have low power consumption and smaller area we use NAND based PFD.